Greetings and Happy Monday! We had a wonderful weekend! I can’t say how much we are LOVING this spring like weather! And since it is the end of February, I think it’s high time to put away the Christmas tree…. This year we have been busy finishing up our bathroom renovation, getting new kitchen appliances and planning a wedding. So busy that I’m embarrassed to admit I still had our artificial Christmas tree still standing in the living room! I did take all of the decorations off a long time ago, but since I got the tree for free this year, it didn’t come with a box or bag. I kept meaning to order a storage bag and then I’d forget. FINALLY I ordered a bag. The Christmas tree came from Frontgate originally and was a 7 1/2 foot pre-lit artificial tree. The lady I got it from said the lights had a short and didn’t work properly. She bought a new tree and was giving this one away. She did keep the storage bag however but who was I to complain? I got a free tree and as it turned out, the lights worked perfectly! All I needed was a storage solution. Before I disassembled the tree, and unhooked the plugs I labeled them with a permanent marker so next year I could remember the sequence. (I think maybe the original owner mixed up the order of the plugs, thus why it didn’t work) The tree comes apart in three places and has a base. 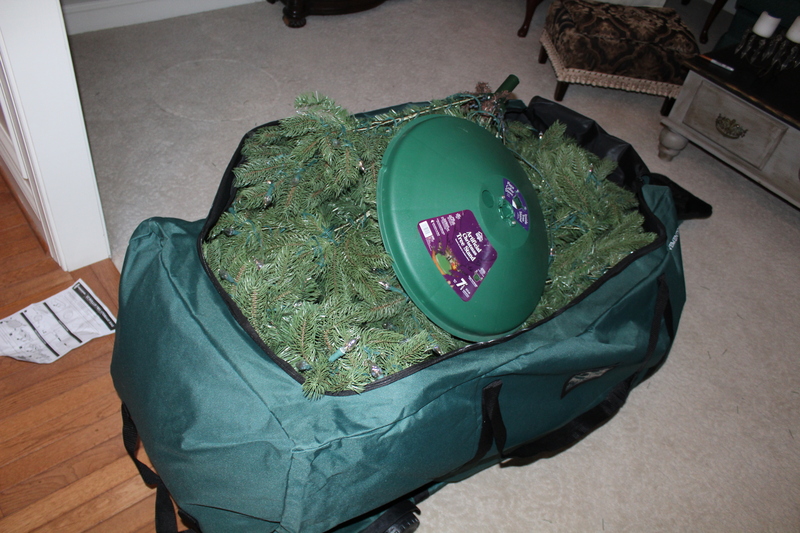 Once I pulled apart the tree I flattened it out as much as possible and stuffed it in the bag. It fit!! Look how nicely it fits! This bag is very well made of sturdy green canvas. It has straps on all sides plus the wheels which makes it easy to move. I dragged it out to the garage to get it out of my way. When my husband gets tired of it being in his way in the garage, he will haul it up to the attic along with the other huge artificial tree. Fireplace Extraordinaire-An awesome wood stove!